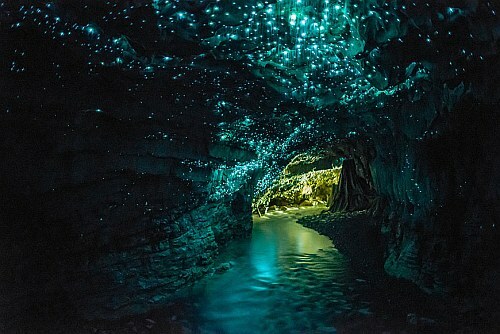 Air New Zealand is showing what appears to be mistake fares from Seattle to Auckland, New Zealand for $419 to $448 CAD roundtrip including taxes. IMPORTANT: Do not book anything non-refundable (such as hotels) for at least 48 hours until it becomes clear whether or not the airline has actually issued the tickets. Update @ 1:15 PM PST - These are no longer showing up on Google Flights, but I am still seeing them on CheapOAir when trying random dates. It's worth trying Monday, Tuesday, Wednesday, Thursday, and Saturday dates in the months listed above. IMPORTANT: Cheapoair.com is in $USD. For the price in $CAD, multiply the prices that you see by 1.27. On Momondo you may see a few different booking sites showing these, such as SmartFares or CheapOAir. I would go with CheapOAir - they have a better chance of being able to ticket these fares based on past history. You may need to scroll down the Momondo results to see different booking partners. Update @ 1:50 PM PST - I've seen reports from people in the Facebook group that they have been issued tickets already, and have even been able to select their seats on the Air New Zealand website. - As of 1:50 PM PST, these are still showing up on the CheapOAir.com website. Update @ 2:15 PM PST - It looks like this might be over. Haven't seen any cheap ones in the last 10 minutes. flight deals, seattle, sea, australasia, new zealand, oceania, auckland and akl. 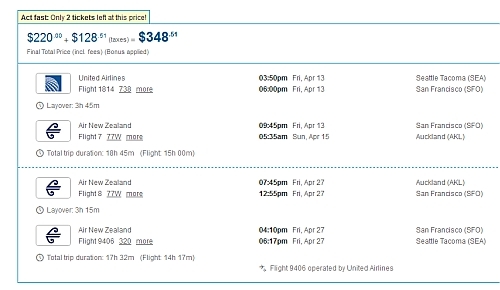 10 Responses to "Seattle to Auckland, New Zealand - $419 to $448 CAD roundtrip including taxes | mistake fares"
1.21pm - they seem to be gone already. Question: The flights still show up on CheapOair but do they honor the price? anybody know? I also cant seem to find them, gone. 1:43 pm - they showed up on CheapoAir but when I tried to book, after inputting my cc, and pressing book, they say price has changed. Worked for me! Leaving April 15th and returning April 22nd for a grand total of $419!!!!!! Thanks Chris!! Update @ 1:50 PM PST - I've seen reports from people in the Facebook group that they have been issued tickets already, and have been able to select their seats on the Air New Zealand website. My flight has been cancelled. I bought one of these. Anybody else? I think it is wrong they can cancel tickets like this! The chance that your flight could be cancelled is always something that can happen on these deals. Chris makes that very clear. If you don't like the chance of that happening.....don't book.